May's to DIY For Box from Darby Smart was supplies to make candy suckers. I've never worked with candy melts in molds before, so I was excited to try it out. Like always, all supplies needed for the project were right in the box that was shipped to my door. This was the first time the instructions weren't in the box though; there was a link to find them online. I poured some of the candy melts in a pyrex measuring cup and put them in the microwave for 30 second increments. After the third round in the microwave, the candy was fully melted. The box included four different colors of candy coloring. This project was easy enough that Henry could help, so he got to pick the colors. Blue is his favorite color, so that's what he chose first. After mixing completely, We put the candy into the molds and Henry placed the sticks in them. Then, he chose red for the lips. I added quite a bit of coloring because I wanted them to be RED. We had some blue left over, and waste not, we made a set of blue lips along with using up the red. Both trays of suckers went into the fridge to speed up the setting process. The suckers came out of the molds with a little excess candy. They were easily broken off or shaved off with a knife. There they are! Fun fun! Wouldn't these be great for a baby shower for a boy or a gender reveal party? My dad (and mom) were visiting, so he got to try one. What a fun project! 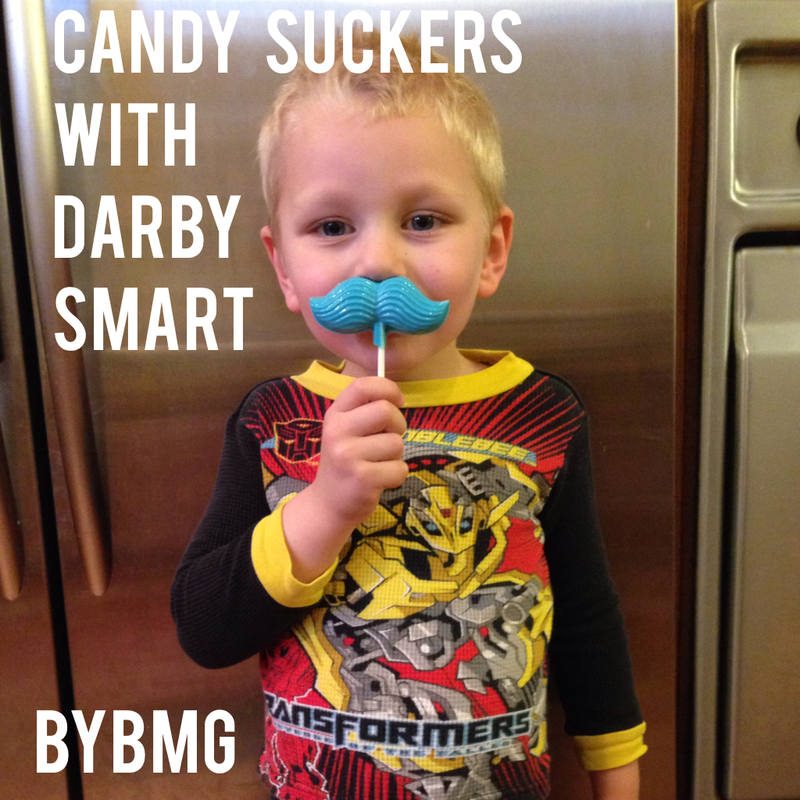 Have you tried Darby Smart yet?